If you missed yesterday’s Senior Bowl preview and thoughts on Parris Campbell, check it out here. Mississippi State center Elgton Jenkins won two battles against Dontavious Russell. Jenkins looks the part — good size and length. His hands are a little wide at times and he needs to lock inside and finish but he handled Russell fairly easily. Kingsley Keke looked really good on two reps against the tough, physical Dru Samia. I’ve not watched much of Keke but this had me wanting to see more. Good quickness for his size, nice hand use to work free. Jonathan Leadbetter isn’t the quickest but he looks great with ideal size and his hand use was good here too. He refused to be blocked on back-to-back reps against Dennis Daley. Leadbetter is talented. Can he run a decent 10-yard split? He has a pro-future. Oklahoma guard Ben Powers handled Demarcus Christmas on back-to-back reps.
Oshane Ximines and Oli Udoh split two reps with both getting a win. Ximines’ first rep was laboured and Udoh handled him easily. Ximines did a lot better on the second go-around. They paired Andre Dillard and Montez Sweat. Nice call, Niners coaches. Dillard over-set on the first step and gave up an inside pressure. Sweat tried the same move on the next rep which was a bit disappointing and Dillard read it and re-set better. Daylon Mack, a late call up, had a couple of good reps.
Jaylon Ferguson looks really raw. He just ran straight into two reps with no real plan. The second time the tackle used his aggressive sprint against him and let him over pursue and land on the turf. It wasn’t a good look and highlighted how much technique work he needs. The South session ended with Tytus Howard taking on Montez Sweat. Howard handled the speed rush initially but on the second rep ended up on his backside. His footwork and hand-use was appalling. It looked like he was dancing to Justin Timberlake, not attempting a block. Sweat jabbed him violently in the chest and sent him to the turf. It was a great rep for Sweat showing off his length and some power. It was an awful rep for Howard. Watching the North receivers vs DB’s — Terry McLaurin was unstoppable and showed off the +140 SPARQ athleticism he has. He’s one of the most underrated players in this draft. Excellent quickness, playmaking, good technique. The star of the day for me. Marquise Blair looks like a very smooth athlete at safety. Keep an eye on him. Drew Sample, the Washington tight end, also looks useful. He had a really good rep vs Darnell Savage. Blair and Sample lined up against each other. Blair won — but they’re a couple of players to keep on your radar. Andy Isabella has too many wasted steps in his routes. On one rep Darnell Savage wiped him out as a consequence. He wastes his track speed by trying to do too much to get open. Trust your speed. It wasn’t a good first showing for Isabella who also had some drops. The North DL vs OL drills were interesting with some surprises. Washington’s Greg Gaines had a terrific session, dominating most of his snaps and working to create pressure. He easily beat Garrett Bradbury on one rep, then beat Chris Lindstrom. It was a great performance from Gaines. Husky team mate Kaleb McGary equally looked the part on the offensive side of the ball. He dominated Sutton Smith on two overmatched snaps but looked good against the big D-liners too. McGary appeared in complete control and oozed class. The best offensive linemen just execute in these sessions. Good footwork, don’t over-extend. Excellent work from McGary. Michael Deiter had a poor performance which was disappointing. He was overmatched on one rep and didn’t exert his authority playing inside. He was occasionally struggling to cling on. It wasn’t a good display. Zach Allen was also a disappointment. He bull-rushed Dalton Risner well on the first rep but after that just looked like an average athlete. No pop, no initial quickness, no counter. He was easily stoned on a couple of reps so they moved him from the left end position to the right. On his next snap he was twisted and sank to the turf. Not a good showing. Max Scharping had a decent display at left tackle aside from one bad rep against Jalen Jelks. The Oregon pass rusher jolted him to the turf unexpectedly. It was a good rep for Jelks. TCU’s L.J. Collier looked really twitchy and quick and was one of the big winners in the session. Renell Wren beat Garrett Bradbury with a power move on his first rep then exploded into the backfield with a knifing rush on his second. Bradbury had his revenge on the third of Wren’s reps. There’s so much to like about Wren but he plays with a degree of recklessness. For further analysis on the session I’d recommend listening to Tony Pauline’s podcast from Mobile. It’s very good news for Montez Sweat. He’s 252lbs which is where he needs to be. Not too light, exceptional height and length. He has to be on Seattle’s radar. Gardner Minshew could be a big riser here if he has a good week. That hand size is pretty significant given he’s not the biggest. He can work his way into the day-two conversation with a big Senior Bowl. He needs to show an ability to drive the ball downfield. Mobile is a king-maker at QB. Maybe that’s another part of why they are so interested in Jamal Peters (though we don’t have his measurements yet). Lonnie Johnson has great size though and is only 1/2 inch short on the wingspan. Anyone looked at him? I think the two names listed above to watch for the ‘Hawks are Isaiah Johnson and Evan Worthington. Both just look like players that PC likes! And they should be available on Day 3 as well…thanks for posting this! From a strictly size standpoint I think two guys jump off the screen and if they test well at combine have to be on Hawks radar. Montez Sweat -ideal LEO body type and length. Sub-1.6 10yd split and he goes near the top of the list for Hawks potential picks IMO. Charles Omenihu – The perfect 4-3 DE body type. Wow 6′-5 1/2 , 36+ inch arm at 275lbs. He is going to be a huge riser if he plays well this week and tests ok at combine. His tape was really good this year IMO. Danielle Hunter — 6-5, 252lbs, 34 1/4 inch arms, 4.57 forty, 1.57 10-yard split, 4.35 short shuttle, 6.95 three cone, 36.5 inch vert, 10-10 broad, 25 bench reps.
Late third round pick. #88. Sweat’s production is superior to Hunter’s who was very raw at LSU. However, Hunter didn’t have the character question marks over a departure from Michigan State. Something to consider because Sweat will be talked a lot now as a potential early pick. But teams are generally wary of lean pass rushers. Of the two I actually prefer Omenihu. I think he has more traditional 4-3 DE size and seems to be just starting to scratch the surface with his talent. A 301-pounder, 6-5 Wren clocked a 4.85 40 this offseason with a 2.88 20-yard split. He has a vertical jump of 34.5 inches and a broad jump of 10 feet. Wren (22 tackles, three TFLs last year) squats 600 pounds and benches 430. At ASU’s final conditioning session in July , he put on a show in the weight room. While teammates pushed up reps of 225 pounds, Wren added extra 45-pound plates to each side of the bar. He put up 315 pounds 11 times. He had modest production this past season, with only 4.5 TFL and 1 sack. But don’t let that turn you off because he was mainly asked to play 0T or 1T, whereas he should fit better in the pros I think at 3T. He says his DL coach likes to compare him to Chris Jones. In interviews he’s a calm guy who is big on his faith and has plans to go into law enforcement after his NFL career. In other words, he’s not going to be one to get himself into any trouble off the field. I think this is a guy who might get overlooked in a deep DL class and because he’s still kind of raw, but could be molded into just about anything. Tape will not blow you away, but maybe early on Day 3 Seattle could find a powerful pocket-collapser project. Wren is quite frustrating to watch. There are snaps where he just obliterates the center, dumps him on his back. I’ve not seen D-liners beast a center like Wren before. But then there are other snaps where he’s out of control and pushed around a bit. Incredible physical talent but needs consistency. Agree 100%, which is exactly what I tried to imply in my last paragraph. I say put him in the best position to use his strength (literal and figurative) and coach him up. And I think that’s probably ok. Ideally, you want to see polish in players. But consider where he is expected to go — you really just want to see flashes of what these guys are capable of. Wren is probably a good R3/R5 candidate in most years. Inconsistency will do that. Given how teams are likely to load up on DL early and often, there is likely to be a bit of a break between the Tier 3 guys and the lower tier DL prospects. Also worth noting, that ASU played with a lot of young players, including true freshmen on the DL. Wren had to carry the water for basically the entire unit. It’s likely he played significantly out of role and position due to personnel circumstance. Those skill sets seem more tailored to a 1 gap attacking DL. Yet he was consistently tasked with playing 2 gaps to protect team mates. Not a bad R4/R5 consideration though if he’s still on the board. Especially since Seattle has a history of double dipping into the deep talent pools of drafts. Seattle does like their athletic freaks and Wren qualifies. I can almost guarantee he will be the most explosive RB at the combine, as well as one of the fastest. So it’s great to find out he’s got great length and hand size for an RB to grow in the passing game and blocking. Excellent length there for blocking and catch radius. Unique. Wesco is cool. I want what the patriots have in Devlin. Hill looks out of shape on his Instagram to my untrained eye. Looking like a guard to me. If they’re close don’t throw them out until they’re measured again at the combine & pro day. A couple years back several measurements at the Shrine & Senior turned out to be wrong. I’m assuming this was a reply about the CBs? 1. Yes, I have not thrown them out. Have listed all those who are somewhat close to the mark. 2. I think it’s usually just the Shrine game where arm length is usually anywhere from 0.25-1.00 inch shorter than the Senior Bowl and Combine. For example, this year Udoh had 35.75 at the Shrine and 36 at the Senior Bowl. Daylon Mack had 31.75 at Shrine and now 32 at Senior Bowl. 3. Either way, this does not affect wingspan measurements. In his Senior Bowl presser, Deebo Samuel comps himself to Golden Tate. Another player I can see us being interested in. Not just for the self styled Tate comparisons. He’s an explosive player, lost time to broken leg in 2017. A very good returner. It’s worth considering since Lockett’s value as a WR has exploded. We could easily be in the market for a return man to alleviate risk to Tyler. That he’s an electric player with the ball in his hands is bonus. Pete seems to gravitate to those kinds of players (Tate, CJ Procise, Harvin etc.). Seems like the WR position is kind of undersold in this class. Could be good day 2/3 value to be had at this position. What is going on out there…? Agree completely. I think Buggs is a day #3 guy anyways. There’s a rumor that Buggs was not well liked at ‘Bama and coaches couldnt wait to see him leave. Take it FWIW. Charles Omenihu has caught my eye, for sure. Scouts see him as a 5-tech–and with the news about Naz moving there, I gotta imagine that is a position they look to add depth towards. Especially if they feel good about Rasheem Green and Jacob Martin’s development. Omenihu’s length, production, and draft stock seem to fit well with Seattle’s desire to 1) trade down and 2) get an athletic, productive DE/DT. I think he is definitely a guy to monitor this week and into combine. Like him a lot from what I have seen so far. Surprised he is not getting more buzz as he had decent production this year as well. Anxious to see if he explosive when he tests. So many DE prospects here at the senior bowl. most of these guys have good length but Omenihu is freaky long. Tony P. says Allen probably won’t test well. Not a big surprise but probably means he’s more likely to be a patriot than a sea hawk. Ferguson and Sweat are more the seahawks cup of tea due to the athleticism factor. Also, for those lookin at Wren for day 3, Tony has Wren as a R2, looks like a good 3T prospect. I really want to see if he can cover with his safety background. If so, he’s a serious option if we lose KJ. Guy looks very solid and quick. I’d also like to see more of his coverage abilities. Will be a shame to see KJ go, but seem inevitable given his FA cost. Anyone watched Michigan St S Khari Willis? Kid can ball. According to mockdraftable which is very useful, Montez Sweat has the longest wingspan for an EDGE since ’99 when the combine info became public knowledge. Seahawks will pay attention to stuff like that. Traits, traits, traits. Buffalo QB Jackson has a cannon for an arm, tall, and had a 74 yard rushing TD. Been waiting for this day a long long time. I love at least half a dozen of these QB’s! Some guys I’m paying close attention too. Let’s start with 3 guys I LOVE. 😍Miss St DE Montez Sweat. If he’s there when Seattle’s on the clock, do they move back? I wouldn’t. 😍Texas D-lineman Charles Omenihu. Freakish physical profile, tons of upside. Do they have this guy already in Green? 😍BC DE Zach Allen. That’s a grown a*$ man right there. Think Seattle will really like him. Baylor WR Jaylen Hurd with some great size. Interesting prospect. Stanford LB Bobby Okereke with some freakish length for his size. Keep an 👀 on him. Arizona St. DT Renell Wren. That’s one of my guys. 3-4 skill set that would fit perfectly in Seattle’s hybrid front. Michigan St S Khari Willis is thick. Something about him that says ‘Seahawks’ to me. One of the better tackling safeties in this class. Just a good, solid football player. Late day 3. Utah S/DB Marquise Blair is rail a** thin and doesn’t really have the length of a Seattle corner. UVA S Juan Thornhill. Really like his game. Old Dominion OShane Ximines. Not a huge fan, but Seattle might be. Interesting he’s gonna play LEO this week. Seattle meeting with an ODU WR at the Shrine game combined with what position he’ll play makes my antennae pick up more than draft media mocking him to the Hawks. The sad part is that the Seahawks will probably trade back no matter who is available at #1. I was thinking about their draft strategies. They have had two first round picks in last six years, since 2013. Does it show? I look at the roster and try to figure out who they drafted that I would rate as a first round team member – regardless of where they were picked. Russell Wilson (3rd), Doug Baldwin (UDFA), Lockett (2) and Carson maybe but not much longevity yet, Ifedi (1) yes he is playing for 5 years, Britt (2nd), the tight ends can’t stay on the field. Really there are only 2-4 names I consider first round talent. Defensively there is Clark (2), Reed (2 or 3), Wagner (2), KJ Wright (5) based on experience, Tre Flowers. How long can the Seahawks avoid picking in the first round and still field an excellent team? Does quantity of picks overcome quality? It seems like it could = but when they face teams with real first round talent – it is a struggle. How many first round type guys do the patriots have? Only prowbowlers this year were Brady and Gilmore. Oh I’m sure they’ll trade back as well. Vol, do you like Anthony Nelson? He seems to be a really intriguing option, too. Personally, I like his tape more than Zach Allen. I do. I think Allen is more Pete’s type outta the 2, but there’s some similarities there for sure. I’m unsure on Sweat and Omenihu, just waiting to see them perform. I like Zach Allen’s game, but is he too similar for the Hawks to Dion Jordan and Rasheem Green? Okereke I didn’t like on tape. Great length was obvious even before measurements, but he’s not fast enough to make it to the sideline and doesn’t bring the aggression I was looking for. Commented on Wren above. Someone else commented Pauline graded him R2. That’s a little rich for my blood. I’m thinking early Day 3. But there’s a lot to work with. Haven’t seen Ya-Sin, but they said he’s ripped. Will take a look at Willis. Blair didn’t impress me either, despite Nagy tagging him as a “Seattle safety”. Oshane Ximines is a top small program edge rush prospect. He has slimmed down to 240 on a new diet before bulking back up. At Old Dominion, he says he ate “nothing but Taco Bell.” @seniorbowl . Nothing like Green and if Jordan can’t be upgraded from they’re gonna be in trouble. What if Seattle feels like they already have 2 speed rushers to build around in Clark and Martin? I doubt the Seahawks are pinning their hopes on Clark & Martin providing a dynamic speed rush. They’ll be adding another DE who can get after it. I’ve been looking at safeties since last night and I’m digging this group. Finally got around to watching Maryland’s Darnell Savage. Whew! That Temple game is unreal. Man, what a difference in quality on the OL from Shrine Game to Senior Bowl. The interior OL especially looks like it did not come to get pushed around. Whew, what a rep by Sweat before the break! That’s gonna be all over Twitter soon. If it’s the one I think it is — shoving the guy on the floor — then you’re right, it’s all over twitter. I have to say, no idea what the tackle was doing. Who was it? He initiates a kick slide and then does this little shimmy, sways his arms back and forth. I thought he was going to finish with ‘jazz hands’. Maybe he was? Before Sweat just shoved him over. He’s not going to get opponents like that in the NFL sadly. An absolute gift of a rep. And I like Sweat. It was Alabama State OL Tytus Howard. And yeah, he kind of had a deer in the headlights moment there. Just updated the post with some notes on that practise. Now watching live. Nice. Him and McLaurin are my 2 favorite ADs there that I’ve seen. Boy Ya-Sin recovered fast there. Yes, no doubt he is fast. But he only recovered somewhat on that play because Samuel was asked to run a double move. From other angles it’s easier to see. Otherwise he was toast by 2-3 yds. Samuel’s footwork looked really good on all his reps I saw. Watching the practices Sweat moves and looks like an NFL edge rusher. Like him more every time I see him. Two of the most physically impressive DL in the draft might be from Miss St. Both Sweat and Simmons have perfect body type and athleticism to excel at next level. I don’t think either make it to 21 but if they did I think you take them even with only 4 picks. I like me some David Long. Ooohh. Missed this somehow, but W. Virginia LB David Long is at the SR bowl? Such a unique player. Hope he has a good week. Fun watch. He’s small but like his coach says he can get off blocks. Tillery and [Greedy] Williams aren’t the only early-rounders with some character concerns, another player who has some questions about his makeup is Florida’s Jachai Polite. Sources with the Gators said that Polite was a good teammate and liked in the locker room, but some NFL evaluators have concerns about Polite having issues with maturity and accountability. One team source said Polite’s talent level is worthy of late top 10 to early teens, and if he slides into the mid-to-late teens, it will be because of the character concerns. Jon Gruden seems to be taking the Senior Bowl a bit too seriously. There’s MY GUY Terry McLaurin! Speed, athleticism, character, blocking, reliability (149.2 passer rating when targeted for 2018). +1 he would be a great fit. Any chance his on the board in Rd#3? That was where I had penned him in my Seahawks mock I’m working on, but if he dominates all week, he could go early R3 or even late R2 if a team falls in love. I had kind of wished he hadn’t got the late Sr. Bowl invite, just so he could stay out of the spotlight. But realistically, even if the media don’t hype him, teams know about him. And he is going to be a star of the Combine anyway. We’ll just have to hope enough WRs are taken before him to push him down to us. I hope so too he just looks like a Hawks WR. Can you imagine him and Locket outside with Dough working the slot and Moore as WR #4. That would be a great group that would excel in todays NFL where WR separation seems to be more important that size. I still don’t think it’s out of the question for Seattle to go O-line early and strengthen a strength. It could happen. I think it’s unlikely because I don’t see a player that screams ‘Seahawks first pick’ among this OL group. Especially when they inevitably trade down twice. But as noted a couple of times recently — their first pick will be dictated purely by the range there in and who’s left. Not even Lindstrom, Dieter, or Dillard huh? You’ve got to think about what Seattle goes for with their first picks. It’s always traits. Difference making physical qualities. Not for their ‘1st pick’ sure, although I think Dillard is gonna surprise some with how he tests. Maybe it’s a case of ‘tomato’ ‘tomatoe’ but early for me is within the top 100. In that case I could see them drafting an OL if the right player was available in say the third round. No doubt there it’s possible. I think the third round is going to be a bit weird this year. Kind of a no-man’s land between a lot of players you really like and a bunch you view as day three value. Little prediction… they might trade out of round three and get a bunch of day three stock. But in terms of their very first pick I’d be surprised if it’s OL. Deiter didn’t look anything like an early pick today. Lundstram… I’m not taking him early. Dillard has some talent as a pass-protector for sure. But he’s not a freakish athlete. He’s solid. Someone will take him for the pass pro technique and the way he sets. I think there’s enough big, long OT’s for Seattle to wait on that position. Will be very interesting to discover how far they trade back. Just done a mock for my own entertainment and hard to see where the value is once you get by pick #35. Some players I/we thought might be there (eg Hockenson) won’t be. Not sure Sweat lasts that long any more. Not sure Parris Campbell will. If they want their freaky first pick as per… D.K. Metcalf might be them shooting their shot. Assuming he lasts because of the rawness, injury and the drops. I will take 1 Indiana Long Snapper please! Daniel Jeremiah Top 50 up. Glad to see Riley Ridley get some love at 32. There are things I really like about that top-50 and things that are just so WTF I don’t even know where to start. I really like Adderley. I mentioned earlier that I’m digging this safety class, but I see him as more of that 35-45 range type. You’re digging this safety class!?! I hate this safety class so much. And I want to love it because I’m so frustrated with Thompson. Maybe I should give him a break but he just has so much to live up to. Anyway. So many of the ‘ballhawky’ safeties just won’t tackle. I wanted to love Lukas Denis at BC but he’s like a matador out there. I do like Adderley a lot but he’ll probably go higher than he should. If we take a S i figure it will be a late profile pick that they’ll hope to coach up, and even then only if they procured enough draft stock. I like the corners much more than the safeties. Carroll seemed very positive about Delano Hill. I think McDougald/Hill — at this stage — could be how they view the 2019 starting safety’s. And Hill did play well before his injury. I like Marquise Blair. I think there’s something there. Big thanks to Jim Nagy for turning me onto him. Big hitter, fluid athlete. Like him as a day-three target. You’re right though. It’s a rank bad safety class. How’d TCU’s LJ Collier look today? He’s got an interesting physical profile. Inconsistent on tape, but kept flashing when I was watching Ben Banogu. Thought Collier was the superior talent. Haven’t been able to catch the North practice, was really impressed with Deebo Samuel and David Sills from the WR/DB section of the South. And Sweat was my favourite of the DL/OL practice. Makes me feel a whole lot better about him as a prospect, wasn’t sure before I’ll be sure to revisit his tape. In my eyes Sweat is really seeing himself apart from some others on my radar, especially as someone who wants a Cliff Avril replacement more than anything. Hoping we get him after trading down into the early 2nd. 1. To satisfy teams about his character. He’s a hard one to work out in TV interviews. And earlier his agent, reportedly, stopped him from doing media interviews because he’s not a great talker (which was a bit weird). There’s something to answer about his time at Michigan State. The Seahawks took Malik McDowell so not sure how much any of this will bother them. But it could be the difference between Sweat going in R1 or a bit later on. 2. He has the size and length. Now he has to prove he has the speed. Cliff Avril ran a 1.50 10-yard split. He probably won’t match that because it’s insane from Avril. But if he gets in the 1.5’s he’s in the top-tier. Apologies for hijacking the comment section but EDGAR MARTINEZ HOF!!! If you’re an Edgar fan and you never knew about his eyesight struggles, do yourself a favor and read this. It’s a spot on assessment. There are some very strange things about the top-50 though. No Parris Campbell, no D’Andre Walker but guys like Garrett Bradbury in there and a few others that provoked a ‘really?’ reaction personally. Bradbury was getting beaten like a drum in one-on-ones today. I like Jeremiah’s commentary, his drafts are weird and couldn’t pick a football game winner if his life depended on it. Get ready because I think we might have a fun summer. Convinced JS will love that dude. And the Seahawks and Mark Rodgers will be drawing the battle lines. The absolute best bargaining position for Wilson is — what else are you going to do but pay me? The absolute best bargaining position for the Seahawks is to be able to say — do you want to be here because if not, we have this guy. The Seahawks will be desperate to keep Wilson, of course. But they’re going to need absolutely every bit of power they can get if he’s thinking two tags and/or a massive game changing extension. Rob I would love that pick for the Hawks but I think there is next to zero chance he would be on the board at 21 . If her gets out of the top 10 I will be absolutely shocked. I think you are right about this being a difficult negotiation with Wilson. I could see them franchising him one year then waiting to see how the new collective bargaining agreement plays out the following off season. I don’t think they’ll be right either. I think he could/should go #1. I’ve been such a huge fan of this blog for quite a while, and it has been so fun following players that you (Rob) have picked as either potential Seahawks’ picks or just your personal favorites. You have totally convinced me on Murray, and if he is there at 21, what would you do if you were GM for a day? a) draft Murray to develop under Wilson and help with the negotiations? I’m almost always a believer in taking talent over need, but with a top 5-7 QB in Wilson and a defense that is almost there, I think it could be a very interesting debate! If Murray is on the board at 21…you pick up the phone immediately, lock in the pick, sprint to the stage, and pop the champagne. That would be highway robbery. If this was the case…I’m going to be in the minority here…you deal Russell Wilson for a boatload of picks (the following season). You are going to get at least two 1st rounders + for him. I would not deal Wilson in that scenario. It’s be the ideal situation. Two more years of Wilson before the cost becomes obscene. Then a possible franchise and trade scenario to coup a load of picks and move to you’re trained and ready young, cheap QB. Or failing that, just keep Wilson and trade you’re other guy. It’s a win win in any scenario. I agree with Rob. Definitely take him. But you don’t rush shipping Wilson out. Wilson has been so dependable. But he takes so many hits. That is beyond dispute. Law of averages is bound to catch him at some point. Wilson isn’t going to be worth less in 2020. Groom Murray. But also let him learn from a master. And if he’s not what you’d hoped, you’re really not in much of a worse position. And even then, it’s not like value can’t be recouped down the road with either Murray or Wilson. Deal from a secure position either way. There are going to be some great WR options from rounds 3-5. The two Georgia and two Ohio St Wr along with Andy Isabella are 5 guys I really like and any of them would look amazing in a Hawks uniform next year. Urban Myer recruited the type of athletes at Florida and Ohio St that Pete did at USC. They are very different coaches but clearly like the same type of player (explosive athletes with unique traits that they can coach up). And let’s hope someone tells Isabella to use his speed and just run past a few guys! Then after you show them your speed you can start making moves because they have to respect it. Him not showing up in the top 10 speeds is just more confirmation that he’s not doing it right. Had a drop too on a fast throw up the middle. Hopefully he settles down and can come out strong on day 2. Also, I did finally skip through the entire vs. Georgia game on YT to watch him. Honestly, he wasn’t as impressive as his stat-line showed. The first three quarters he was almost completely shut down by the 1s on defense. Then he got behind the 2s on a couple deep throws in the 4th quarter, plus a bunch of nickels and dimes. Anyway, it was kind of to be expected since his team as a whole was clearly over-matched and his QB was under constant duress the entire game. So the Senior Bowl is huge for him now that he has talent around him and won’t be the only focal point of the opposing defense, he has to show that he can be a threat. I actually thought he had a decent practice yestetday except for the one drop. It will be interesting to see how he plays the rest of the week now. The small school guys always seem to take a day or two to settle in and get comfortable. I remember Davenport last year struggled Day 1 but then came on. He is not in the same class as McLaurin who is my favourite WR in the draft as well but I still think he would be a nice addition on day #3. Great eight and weight for Sweat. I would love to see McSorley as a Seahawk. I’m rooting for Mcsorley too, not sold on him yet but I’m hoping he convinces me. – McLaurin is my favorite player in the draft so far. – Isaiah Johnson is the only CB that meets Seattle’s arm and wingspan thresholds so far. Good to see he has some speed as well. Just like Jamal Peters though, tape is not great. But PC just wants the ball of clay anyway. – Deebo Samuel is a guy Volume 12 and I (and others) have crushed on since last season, if he could only stay healthy. Great backstory and IMO fair comp to Golden Tate. – Rock Ya-Sin is a favorite of V12 as well and could have outstanding length for the slot? Justin Coleman understudy/replacement if he is too expensive and moves on? 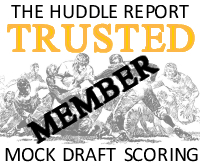 – Travis Fulgham has nice size and great length, so to see him in the top 10 for speed says something. V12 thinks Hawks meeting with Jon Duhart might be a little smoke for their interest in this guy? Albeit without the ball, McLaurin still topped everybody! I’m still surprised nobody ever mentions the weapons Dwayne Haskins had at Ohio State and how he basically just got the ball to his guys with a series of easy passes. I wouldn’t even consider Haskins in the top 10 where he’s expected to go. Wouldn’t take him in R1 at all. We’re all going to see McLaurin in the early rounds after this week. Agree completely Rob I think as they go through he process and people realize just how dynamic the WR were and even his RB that this will be discussed more. He basically had elite level offensive weapons. To his credit he did make use of them however but you are right the degree of difficulty of most throws was certainly not close to what he will see in NFL. Reminds me of the USC quarterbacks when Pete was there. They were so over rated because they had NFL level talent all around them. So many screens, passes into the flat and quick hitters. Haskins could easily be another Leinart. Haskins also looks really slow in his reads. That’s one thing that Murray, Lawrence, and Tua do really well. They seem to be able to pop through reads quicker whilst being able to deliver the ball quickly. Haskins just seems very labored with his play (everything seems a bit slow). I could see it. Medical checks are big. He’s had a heart problem. But he was outstanding on day one and looked like the best OL out there. I’m just about to post a piece discussing him (and several others).